Somewhere in between a more formal full-length gown and a short throwback casual is an emergent summer style with a shorter but unrestrained hemline. The dress itself is sleeveless, but in taking a cue from the long-sleeve short dresses seen this summer, the reef and teal lace dress has an optional addition. Although Nancy Mac is better known for dresses that stand alone, the United Kingdom-based fashion designer has created two lines of shrugs. Either can alter a dress's appearance, but the shrug is surprising more versatile than its original purpose. Any one of them can be dressed down with jeans. The only choice you have to make is which shrug fits with your wardrobe best — a fine knit wool or lavishly embroidered lace. One feels a bit more formal; the other more bohemian. Rather than longer sleeves, Nancy Mac revises the shrug. Most the shrugs are light wool, with detachable corsages made from a fine knit. The shrugs come in soft green, purple smoke, blue pearl, and reef teal. They are specifically designed to cover the shoulders and arms, resting high on the back. Alternatively, Nancy Mac also carries embroidered lace shrugs, with kimono-style sleeves. The shrug hangs loose, making it versatile as a cover-up or to dress up a camisole and jeans. The lace shrugs come in ivory, reef teal and purple smoke. The shrugs accessorize other wardrobes or Nancy Mac dresses. As mentioned, the shrugs were added this year to add length to short-sleeve and sleeveless dresses. 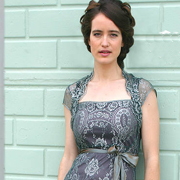 It creates a completely different look for many designs, including the Kristen lace dress (above), which is sleeveless. Although this dress has a paneled skirt that is cut to mid-calf, the scalloped edge keeps it casual. For a different, much more sheer look, the higher cut Olivia dress has a shawl-like collar, scalloped lace-edged hem, taffeta belt, and contrast lining. The design was inspired from the 40s, a flattering classic with an optional belt. What makes it stand out the most is that the cut is classic but the fabric is bohemian modern. Nancy Mac also carries a floral summer shift dress, with a lightly paneled skirt that is gently fitted at the waist. In lieu of a belt, it has a drawstring back and can be accompanied by a lace jacket. The pattern also lends well to the Gabrielle dress. A couple of graphs about Nancy Mac. Nancy Mac is a womenswear fashion boutique in the United Kingdom. It was founded by two sisters who wanted to design a line of standalone separates cut from luxurious prints and fabrics. What makes Nancy Mac unique is that they only design two label collections that are made available to independent boutiques throughout the United Kingdom. This leaves them more time to get involved in other projects, creating designs for specific couture shows and sometimes the Royal Academy. Alternative styles that take the dresses shorter. While many Nancy Mac designs land just above or at the knee, don't discount other designers looking for much higher cut with long-sleeve dresses. Doing so breaks a bit from the classics and brings out a lively 60s vintage. There is considerable more sass than style. The dress itself features a mostly transparent mesh in support of a short black party dress. For something more bohemian, a different fashion retailer accessorized a dramatic floral print with a peekaboo black lace to cover the arms and bring the dress up to the neckline. Summer Classics By Nancy Mac Pin Up 7.1 On The Liquid Hip Richter Scale. What makes Nancy Mac designs work is how effortlessly they make classics modern. Some elements of the dresses even remind me of Downton Abbey. Although the dresses have a different style, the timeless qualities of lavish fabrics and lace are all very visible. You can keep up with Nancy Mac collections at NotOnTheHighStreet, which specializes in helping small businesses and designers in Britain get noticed. The online outlet makes United Kingdom purchases easier, all over the world. The alternative styles were found at a discount retailer, ZLZ.